The Flash #51, written by Joshua Williamson, with art by Scott Kolins, and colors by Luis Guerrero, is the epilogue to the Flash War, and it provides a nice, quiet story with hints at big things to come. Previously, Wally’s reunion with his Aunt Iris sparked memories in him from his pre-New 52 life and caused him to remember his kids that were blinked out of existence when Barry messed up the timeline trying to save his mom. This set off a conflict that stretched into the future, where Zoom convinced Wally that the only way to get his kids back would be to break the Speed Force. 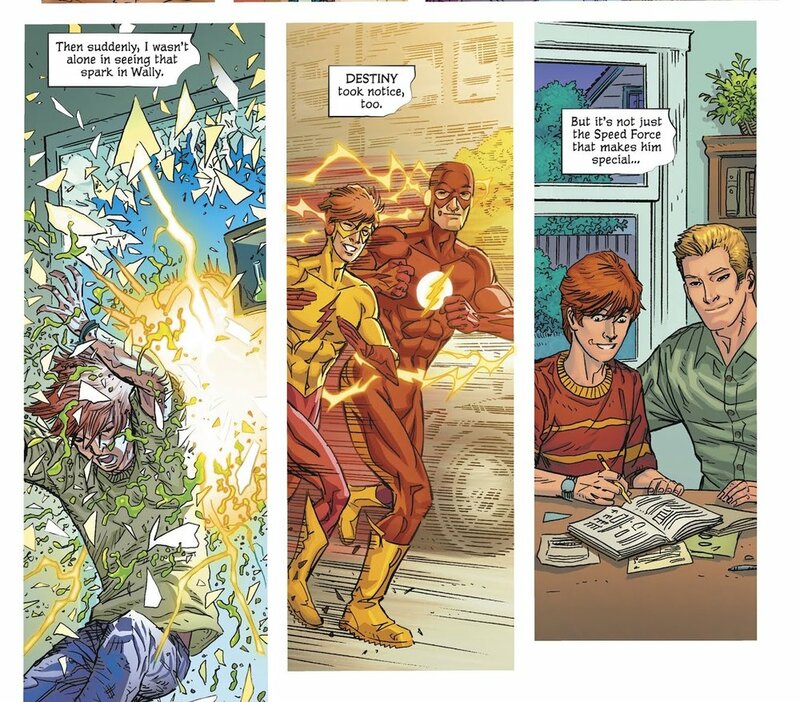 Despite Barry trying to stop him, Wally outran the Flash and achieved his goal. Unfortunately, this gave Zoom access to the newly-discovered Strength and Sage Forces, which he used to fight both Flashes at once. Even though Zoom was defeated in the end, he got away, and Wally was left devastated over his still-lost children. Now, he is running all over the globe non-stop, desperately trying to find a way to recover his children while his loved ones look on concerned. This was a great little issue, wrapping up the Flash War arc and providing some nice character moments for everyone involved. Told mostly from the point of view of Iris as she writes about Wally and his previous life in another timeline, she describes her lifelong connection to him, practically raising him herself when his parents failed at the task, and her deep love for her nephew. It’s always been clear that Wally thought of her as a mother figure, but those feelings have never quite been explored so extensively from her side of things. Williamson portrays her as fiercely loyal and protective of Wally, even telling Superman and Wonder Woman they better not let any harm come to him. 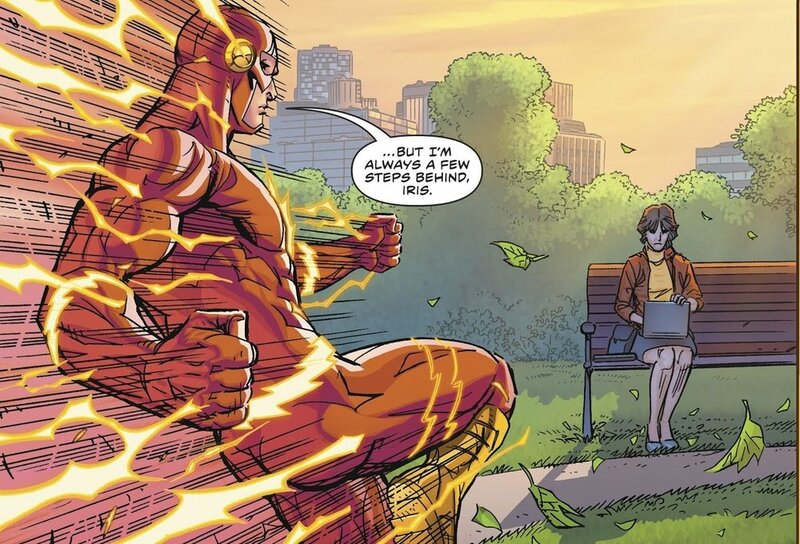 She is also clearly the person that understands Wally best, despite Barry being his mentor, because she has to tell him to stop chasing the younger Flash and let him come to them. Williamson has done a great job this arc showing how integral Iris is to the Flash family, so hopefully he keeps up the good work. Wally is also handled well, despite barely having a chance to speak in the book. When he finally slows down, Williamson provides a raw, emotional side of the Flash that really makes you feel for what he’s been through. Discovering not only that he had children, but that they might be lost forever because of something your mentor did, is a lot to handle, and it is finally taking its toll on him. It’s unclear what’s next for Wally, but the powers that be, if not Williamson, do seem to have plans for him in the immediate future, as the last pages of this story hint. Kolins, a fan-favorite Flash artist from Geoff Johns’ classic run on the book, returns for this epilogue issue and makes the most of it, despite this chapter not having a lot of action for him to work with. He shines in the few scenes where Wally is zooming through the world helping people wherever he goes, and even pulls off the emotional scenes at the end. Guerrero’s colors blend well with Kolins’ art, but they seem to be a little dull for the Flash. The electricity doesn’t quite pop like other colorists manage to do on this book. Maybe it’s just not a good fit for him, but his work would be fine on another title. Overall, this wasn’t the most exciting issue, but it did neatly wrap up the Flash War story, and it does leave readers with a sense of intrigue, not just for the future of this book, but also the future of Wally and the DC universe as a whole. This arc introduced the Sage and Strength forces, brought back Wally’s memories of his family, re-established the link between Iris and her nephew, and managed to alienate the Kid Flash from the Flash Family. Williamson covered a lot of ground, and managed to do it in the most exciting, entertaining way possible. This was one of the most epic, memorable Flash stories of all time, and it will be providing material for the book for years to come, but without this final issue, it would have just been a fun story. This epilogue anchors it emotionally, and really drives home the effects it will have on the Flash Family in the immediate and extending future.